When the thunder of gunfire broke through the revelry of a country music dance hall packed with young people enjoying "college night," Thousand Oaks, California became the site of the 307th mass shooting in the U.S. this year. 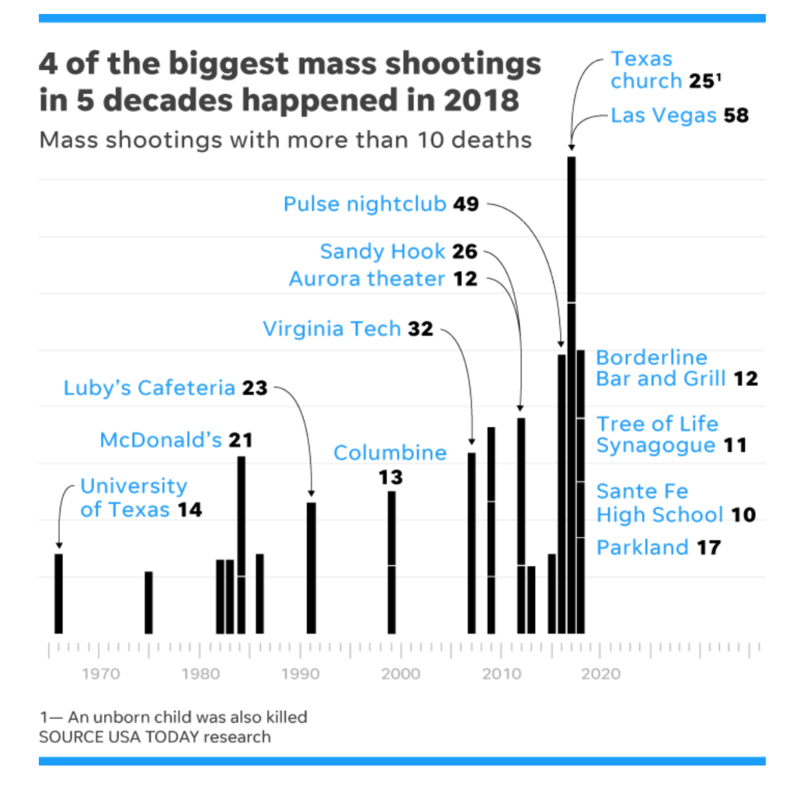 The Borderline Bar and Grill, which left 13 people dead, including the gunman, became the nation's latest mass shooting. Together these tragedies account for 328 deaths, and 1,251 injuries. These events occurred while the country is still mourning the hate and terror demonstrated at A Tree of Life synagogue in Pittsburgh that left 11 people dead, and the series of 16 pipe bombs mailed to prominent Democrats, CNN and critics of President Trump. After Sandy Hook, America vowed it would never happen again, but 1,897 mass shootings have occurred since. The vast majority of the over 5,000 colleges and universities in the United States prohibit the carrying of firearms on their campuses. However, an increasingly extreme pro-gun movement in the U.S. is promoting legislation and litigation that would force colleges and universities to allow concealed guns on campus. Arkansas, Colorado, Georgia, Idaho, Kansas, Mississippi, Oregon, Texas, Utah and Wisconsin now have provisions allowing the carrying of concealed weapons on public post-secondary campuses because of recent state legislation and court rulings. As national partners with the NAACP, we encourage you to read their gun violence prevention briefs and host local #ZetasGetEngaged #NAACP collaborative conversations on community education and action. Suggested programs and activities for undergraduate members include: debunking gun myths at the college dining hall table; hosting campus forums with local politicians to discuss the impact of gun violence and reform; contacting representatives via letters and social media, using #ZetasGetEngaged; holding campus vigils for gun violence victims; etc. For more information and program ideas contact Dr. Denalerie Johnson-Faniel, National Social Action Co-Director at ZPhiBNJSocialAction@gmail.com.